Even when it feels like he is absent, God is always at work behind the scenes. Though the book of Esther contains no direct references to God, his fingerprints are found all over it. The book traces the unseen hand of God, working through the lives of his people to deliver them from destruction. In God Behind the Scenes, Wayne Barkhuizen examines the strange yet gripping story of Esther. He shows how divine Providence was active in preserving the people through whom the Messiah, Jesus Christ, would one day come. Barkhuizen also explains why the message of Esther is so important to our world today. 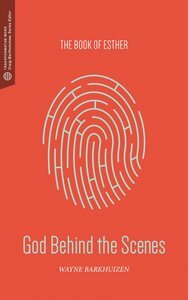 About "God Behind the Scenes: The Book of Esther"
Wayne Barkhuizen serves as rector of Christ Church Pietermaritzburg, KwaZulu Natal, South Africa. He was ordained in 1987 and served as a military chaplain in South Africa. He has served in seven local churches in Johannesburg, Durban, and Cape Town.